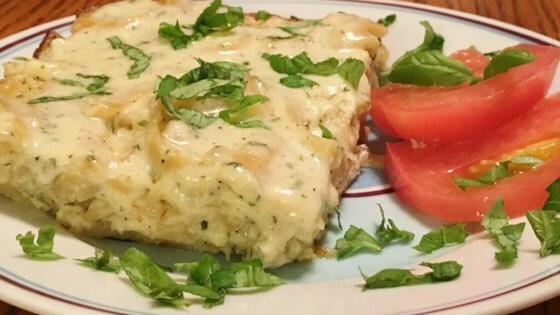 "This is an amazingly cheese-rich dish. I love making this to take to friends' homes as a drop off meal. It gets rave reviews every time! The recipe is adapted from a restaurant in the Mall of America called Tucci Benucch. I attended the restaurant at a business meeting and they gave us a recipe for the baked spaghetti that I have made a few changes to. My husband prefers it without the marinara/meatball topping, but if you're looking to stretch the recipe that's a great way to do it." Bring a large pot of lightly salted water to a boil. Cook spaghetti in the boiling water, stirring occasionally, until halfway cooked through, about 6 minutes. Drain. Stir provolone cheese blend, 1 jar Alfredo sauce, drained spaghetti, ricotta cheese, Parmesan cheese, and eggs together in a bowl. Pour into prepared baking dish. Cover the dish with aluminum foil. Bake in the preheated oven until hot and bubbling, 60 to 75 minutes. Remove foil from baking dish and top spaghetti with remaining Alfredo sauce. Stir marinara sauce and meatballs together in a saucepan; bring to a simmer, reduce heat to medium-low, and cook until meatballs are heated through, 15 to 25 minutes. Spoon meatballs and marinara over baked spaghetti. Pasta lovers unite for this tasty lasagna & spaghetti shakeup! I made this last night and was pleasantly surprised. It's pretty decent when you are in the mode for something out of the ordinary.